Christmas without mince pies is unimaginable. Why? Mince pies have been eaten as part of a traditional British Christmas since as long ago as the 16th century. Then, they were made of meat, but are now made with sweet mincemeat, a mixture of dried fruits, sugar, spices, and brandy. They are pretty much part of the heritage of a British Christmas. Have a look at this easy recipe for the rich, sticky, sweet fruits wrapped in pastry and you will see why they are so popular. Note: while there are multiple steps to this recipe, this mincemeat pie dish is broken down into workable categories to help you better plan for baking. Place the flour, butter, and salt into a large clean bowl. Rub the butter quickly into the flour with your fingertips until the mixture resembles rough sand. Stir the egg into the mixture using a cold knife. Add the cold water, a teaspoon at a time, and stir until the mixture binds, but is not sticky. Wrap the dough in plastic wrap and chill for a minimum of 15 minutes and up to 30 minutes. Choose a muffin or bun tin for the size of the tart you want. Choose from a standard 12-cup muffin tin, down to small canapé size. The number of pies will depend on the size of cup you use. Dust a work surface lightly with a little flour and roll out 2/3 of the pastry to 1/8-inch thick. Cut circles to line the cups of your tin, don't worry if the pastry doesn't come to the top. Dampen the edges of the tart bases with a little cold water and press the lids on. Make a small hole in the surface of each pie with a small sharp knife to allow the steam to escape. Bake in the preheated oven for 20 minutes (15 minutes if making canapé-sized ones), or until golden brown. Remove from the oven and sprinkle with the confectioner's sugar. Mince pies are delicious served hot or cold, on their own or with Brandy Butter, and with cream or even a good vanilla ice cream. They will keep well if placed in an airtight tin—up to seven days. Sometimes they benefit from a gentle warming in the oven before serving. The filling for the mince pies uses Suet which is an animal fat. So, if you don't eat meat, look out for vegetarian version or make mincemeat using an alternative fat such as cold butter. 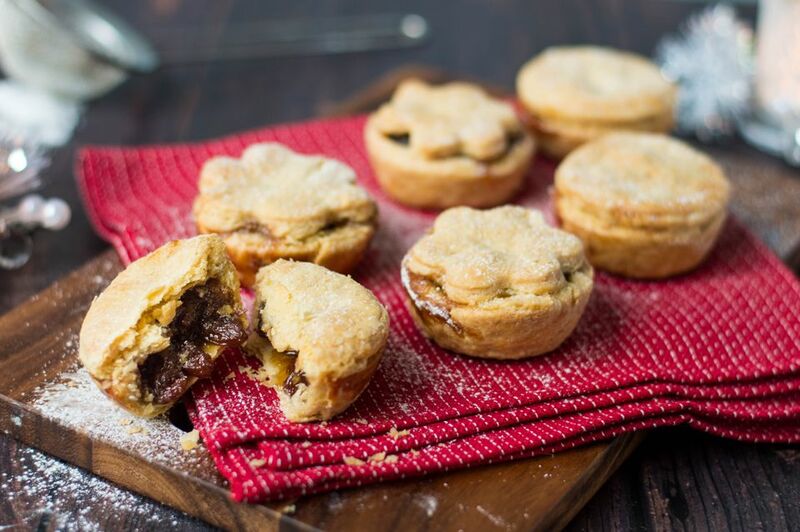 Shortcrust pastry is a traditional mince pie case, but some like puff pastry, you choose. Homemade mincemeat is quick and easy to make and there are also many great commercial brands out there to use instead.